An oil and gas company is reviewing the problems that leading to over budget and on-stream delay. They need to do pareto analysis for lesson learned for the next big project, on what problem that they need to be more focus on. Inadequate documentation to support positions and resolve issues that develop during the execution of the project or retrospectively when large claims develop at the end of the project. Owners often do not have a sufficient number of experienced personnel to manage the technical aspects of a project. Inadequate baseline schedule development and updating by contractors, leading to unreliable progress measurement, uncertain critical paths, and inability to mitigate delay. Owners do not develop a sufficient master project schedule that results from pulling together the work activities from multiple prime contractors. A Pareto chart will be generated for analyzing what problems need first attention. 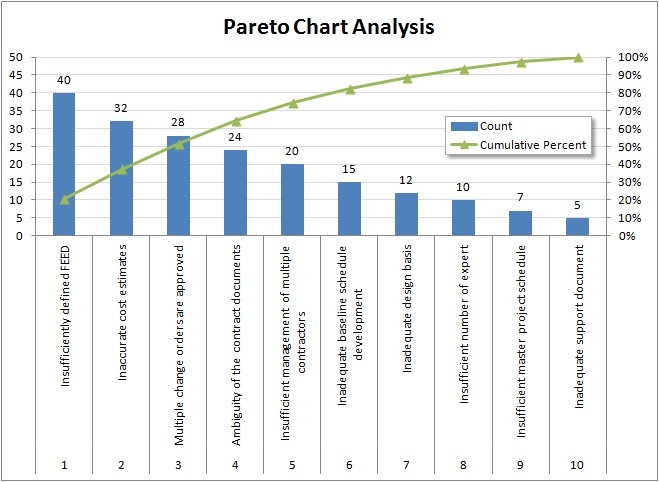 Pareto Analysis is a statistical technique in decision-making used for the selection of a limited number of tasks that produce significant overall effect. It uses the Pareto Principle (also known as the 80/20 rule) the idea that by doing 20% of the work you can generate 80% of the benefit of doing the entire job. Here, they will identify the problems which have the greatest cumulative effect on project delays and over budget using Pareto chart as a vertical bar graph in which values are plotted in decreasing order of relative frequency from left to right. The company prefer to focus only at 20% of the significant problems which will cover minimal 80% of the problem. Figure 1 shows that the most problems that causing cost overrun and company shall pay attention to is insufficiently defined FEED. If the company can handle the above top 5 problems, it means they have solved almost 80% of the overall problems. After knowing the top 5 significant categories to focus on, the company needs to do several actions to solve the problems. Then they should monitor the result on quarterly basis whether a significant improvement has been achieved. You can do all this so maybe you can pass? Let’s discuss your strategy next week….